Last week, the UKFast Campus auditorium hosted Cloud UK Live. A rare treat for all the cloud spotters out there, attendees got the lowdown on the future of cloud computing and how to harness its power. It was a fantastic day with industry legends sharing their insights. Hester reports on the keynote speech from David Rowan. David Rowan, editor at Wired magazine, gave an enlightening talk into the future of tech. From flying drone taxis to AI with autonomous emotion, he shed light on how things that we can’t yet comprehend may well become household objects and second nature within a few years. Rowan urged the crowd to recognise that “Things will never move this slowly again”. This forceful phrase got me thinking. What is future tech? It sounds distant, like it’s something that’s not set to affect us for some time. But actually, future doesn’t refer to the length of time between us and new technology. Future describes the spirit of developments transforming our world from day to day. Future is an attitude; it is a way of thinking, of seeing, of bringing that which seems really far away right up close to our noses. Future tech is the innovation, inspiration and ambition encircling our society right now. In amongst the gobsmacking tech developments he presented, Rowan identified a key question surrounding tech innovation: how do you approach it? When you see potential in a product, do you invest in it, or do you pass it off as a fad? In tech, you can approach innovation in two ways; you can invest in an idea, or you can invest in strategy. And there are realities on both sides of the coin. You can put everything behind one promising tech development; put time, money and all your heart into it and hope that it takes off. If it does, all your investments will be returned to you many, many times over. But if it doesn’t catch on, you could end up trailing in the dust; like many in tech, you might cut your losses and be ready to take on a new challenge, but you’ll have lost a lot in the process. The other option goes like this: you remain aloof, keeping a distance from specific products and services. What you focus on is your business strategy – creating a model that can jump into action as soon as the tech world’s next big thing arrives. When the trend of the decade hits, you’ll have readied yourself to mobilise and monetise almost immediately. Whether you choose to back an idea or a strategy, uncertainty is a guaranteed feature of your venture. 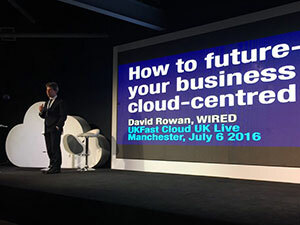 The buzzword at Cloud UK Live, identified by our CEO, Lawrence Jones MBE, was ‘Future-proofing’. Make yourself ready for what’s to come. The truth is, for every one tech idea that takes off, there must be hundreds that fall at the wayside. Yes, you might strike gold and achieve insurmountable success. If that happens, be ready to deal with new challenges that arise, and don’t let yourself get caught out by underestimating your audience. Equally, you might just miss the mark, and instead all your hard work might fade into the past. In that case, don’t give up; chalk it up to experience, dust yourself off and apply all the insight, tools and contacts you’ve gained to go again. Many of the world’s most prolific businesspeople have taken multiple stabs at success before they got the formula quite right. Whichever way it goes for you, one thing remains the same. Whether you choose to gamble or count your cards, it is vital that you anticipate the hand you’re dealt. With tech travelling at breakneck speed, there is no way of predicting the future. But you can at least ready yourself for the consequences it brings. Ensure that you’re up to speed with cloud and future-proofing your business; visit our website for more information on our cloud solutions or give us a call on 0208 045 4945 to speak to one of our experts.